Tabuk – An increasing number of younger Filipinos today are getting tattoos (or, in millennial-speak, "getting inked"). Gone are the days when tattoos are largely associated with criminals and lowlifes. In the past, someone with tattoos may be thought of as a gang member or someone who has done prison time. While tattooing has been a part of Filipino life since before the Spanish came, especially among indigenous people, we're currently witnessing a resurgence of this practice. Why did the early Filipinos get tattoos and why are we seeing a resurgence? Our forefathers once used tattoos to express themselves; their bodies were the canvas, and the tattoos were their art. In particular, ethnic groups have been performing this practice for centuries to mark their social status or accomplishments in the community, or as a symbol of beauty among women. In fact, the Spanish explorers first recorded natives covered in tattoos upon disembarking into one of the islands during the 16th century. The ancient Visayans, as well as the highland tribes of northern Luzon or Cordillerans, are known for their intricate art of tattooing. In the olden days, tattoos (batuk in Visayan) were thought to be widespread in the island. The Spaniards fought against the fierce Visayan warriors, whom they called pintados because most of their bodies were covered in elaborate tattoos intended to intimidate the rivals. The markings gradually increase in number depending on the number of battles one has had. Facial tattoos are reserved only for the most valiant and strongest warriors. At present, the ancient tattooing tradition of the Visayans and their warriors’ courage are celebrated annually during the Pintados Festival. Similar to the pintados, the highland tribes of the Cordillera also practiced tattoo rituals or pagbabatuk. The primary purpose of tattooing amongst the Ifugao, Kalinga, and Bontoc ethnic groups are related to headhunting; tattoos signify a man's transition from being a recognized headhunter to a fearsome warrior. Whereas possessing one indicates a person's successful headhunt expedition, more elaborate tattoos are given only to those who have killed more than ten people. Thus, the more markings a warrior has, the more respect he commands. According to research, Kalinga men are rewarded with a tattoo after killing an enemy in a battle. This tattoo enables him to receive special privileges and lifelong respect from the people in his village. These tattoos have symbolic meanings that convey their bravery or triumph in a bloodshed or even the numbers of heads they have cut off. In addition, tattoos are believed to possess special powers that protect and shield a warrior during conflict. By contrast, Kalinga women are adorned with tattoos on their body to enhance their beauty, mark their coming of age, and boost fertility. Today, this traditional practice no longer exists. The Spanish colonial occupation in the country, along with the introduction of Christianity, has gradually diminished this custom until only a few surviving members can be seen with this distinct body art. Though no longer observed, one tribal tattoo artist and the oldest practitioner of Kalinga tattooing is still thriving. Catering mostly to tourists and younger Filipinos who want to wear tribal motifs on their skin, Whang-od is keeping her tribe’s tradition alive. 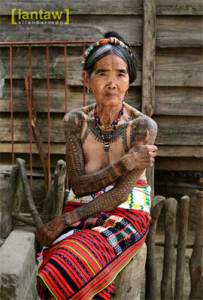 Whang-Od Oggay (Fang-Od) is the last practicing traditional mambabatok or tattooist. She uses traditional thorns, a bamboo hammer, and soot when making a tattoo. She lives in Tinglayan and belongs to the Butbut Kalinga ethnic group. Turning 101 years old this February hasn't stopped her from performing the ancient art of hand-tapped tattoos, which she learned from her father when she was 15. Unmarried and childless, she is passing her skills to her niece with the hope that this culturally noteworthy art will continue to survive for generations to come.